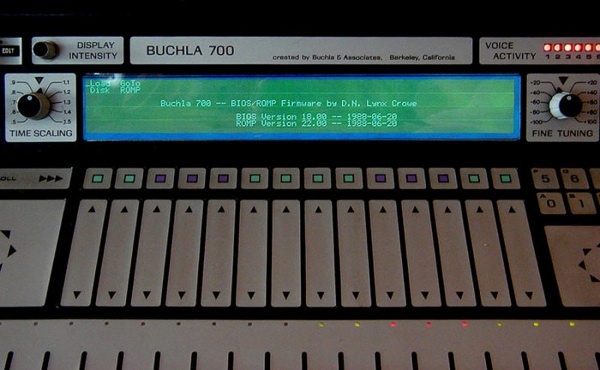 The Buchla 700 was a very sharp looking synthesizer concieved and built by Don Buchla together with D.N. Lynx Crowe who wrote the firmware for it. It was released in 1987. Unfortunately very few were built. Today most of these are broken. Here is one in action. Recently Aaron Lanterman convinced Lynx Crowe to release the source code. I have been poking around randomly in the source code for some time. The first thing I did was lowercasing all the filenames, highly recommended. Most of it is written in C (k&r first edition style) and parts of the code is in assebly. All very tidy and well documented (thank you Lynx). It was developed on an Atari computer and some of the included code is redundant since it is standard and available these days (C standard library code). I wanted to know what the FM-configurations looked like in the 700. 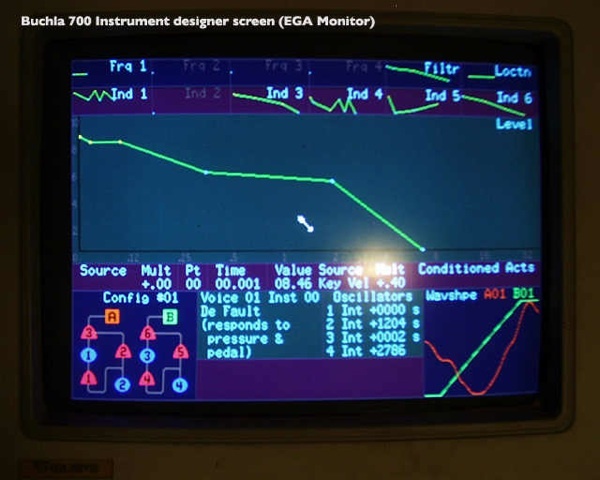 All graphical elements in the 700 are generated, there are no bitmaps or fonts so the only way to find out was to render parts of the display graphics. The display illustration on the Buchla site helped me by giving words to grep for in the code to find a starting point. This way I found ram/showcfg.c which is responsible for drawing the FM configuration diagrams, and lib/include/configs.h which has the configuration data. I copied and pasted together a small program that included the essentials for plotting the diagrams. As a proof of concept I implemented ASCII output to start with. It worked. I found that the display output was not black and white as in the illustration on the buchla site. By using the palette found in ram/instdsp.c and reading up on the EGA color properties i managed to write images in proper colors. This time in X Pixmap format which I then converted to PNG. A friend provided me with a photo of an actual 700 display which was very helpful for me in verifying that I had used the correct palette and getting the colors right. 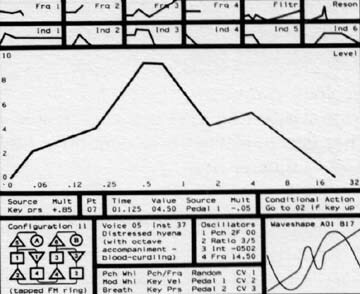 Also confirming that the picture on the Buchla site (see above) is just an illustration, probably from the design phase. The configuration shown there, "#11 tapped FM ring", is not among the actual configurations, however #02 is pretty close.